Welcome to the first Railwaymedia blog of 2013, also marking a year since the first edition. As mentioned in blog number 35, I had intended just before Christmas to go down to East Sussex to get a picture of the soon to be closed Signal Box at Polegate Crossing. I finally managed that trip this week. 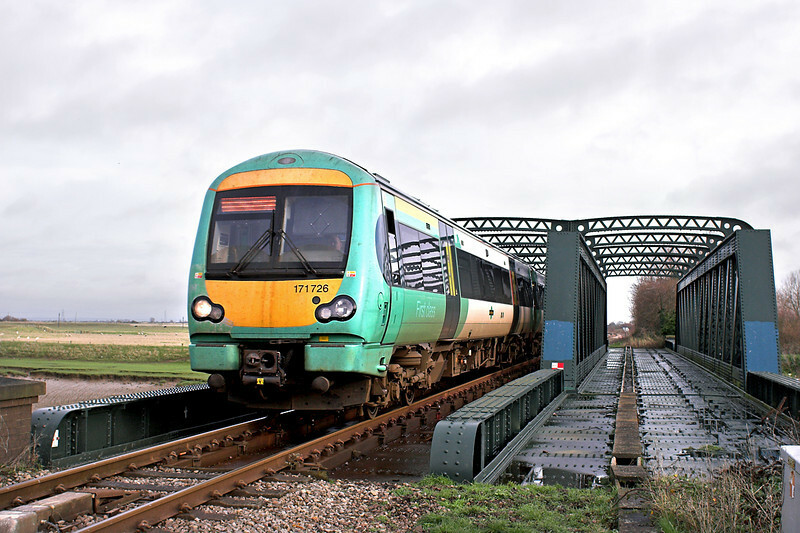 With the days still short and the weather not exactly fantastic, I didn't get to take many pictures of trains, though my additional aims of getting a couple of shots at Rye on the Marshlink Line and also of continuing with my tour of Wetherspoons were reasonably successful. I've not travelled over the Marshlink Line since 1986. I had intended on visiting 10 years ago before the Thumpers finished, but ended up spending time photographing the 205/207 units on the easier to access Uckfield Line instead. Rye is the station on the Ashford to Hastings section where the trains usually pass, singularly unhelpful if you want to catch the train there to get some pictures. The town though, one of the five 'Cinque Ports', is pleasant place to wait an hour. There is a footpath crossing the line adjacent to the bridge over the River Rother. A shot can be taken of a westbound train coming over then a couple of minutes later the eastbound train passes the other way. Rather than wait another hour for the next train I caught a bus instead to Hastings, which turned out to be a more convenient way to get to the Wetherspoons as it stopped right outside! With my next plan being to go to Polegate via Hailsham I had half an hour to play with between buses so alighted at St Leonards. The main road passes near the Depot which services both Southern's Class 171s and also the fleet of Class 73s run by GBRF. 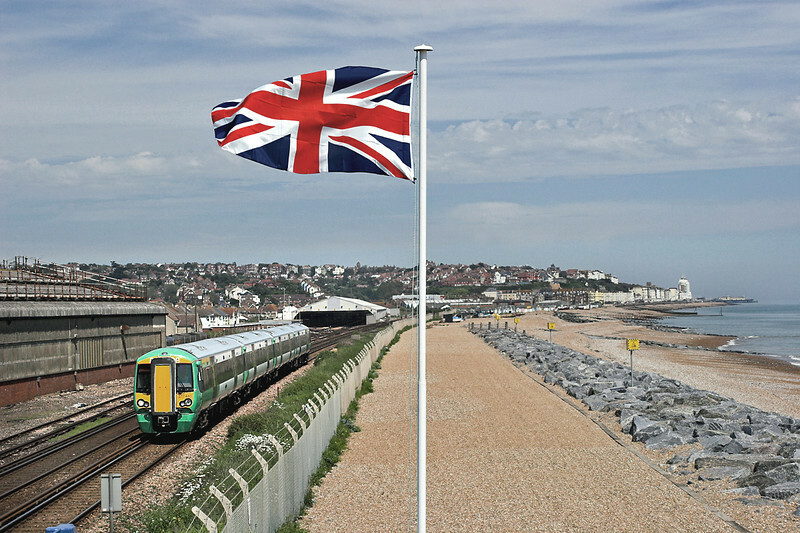 There is a footbridge crossing the line to the beach here; I visited once before in 2006 when an inconveniently located flag pole was obscuring the wide angled shot towards Hastings. Back then there was no flag on it anyway so, as the pole looked silly without, I had a play with the picture in Photoshop and added a Union Jack to it. With the weather being distinctly worse than it was back then, on the bus to Hailsham I began to worry that I might not get to Polegate before it got too dark. In the end I made it fine. 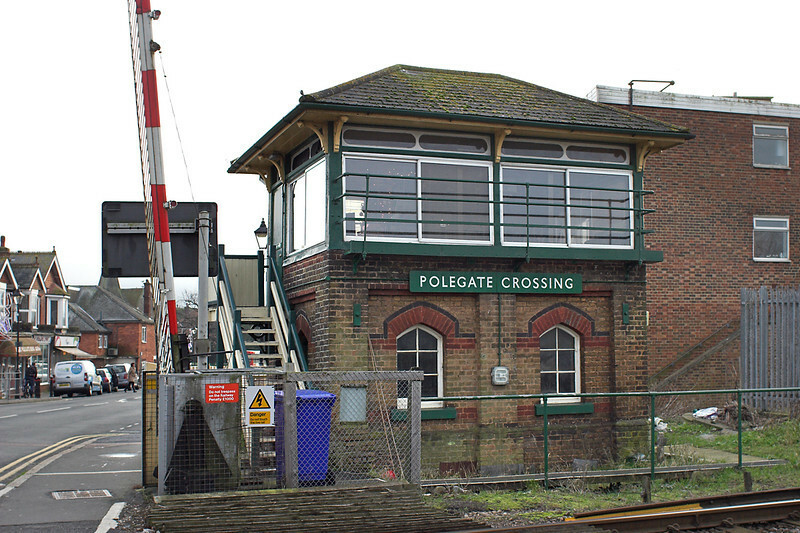 Until November Polegate still has a couple of semaphore signals to go with it's Southern Railway Signal Box, though they all contrast sharply with the station which has been totally rebuilt. The advantage of it getting dark at 4pm is that on a day out I can then go to the pub without worrying that I am missing getting pictures. A Kent and East Sussex Bus Explorer Ticket is very good value at £6 and is valid on most buses in the area, not just the operator you bought the ticket from. Oddly if you buy it on a Brighton and Hove Bus it costs a pound more. The route from Eastbourne to Brighton used to be operated by Stagecoach when I lived down there. 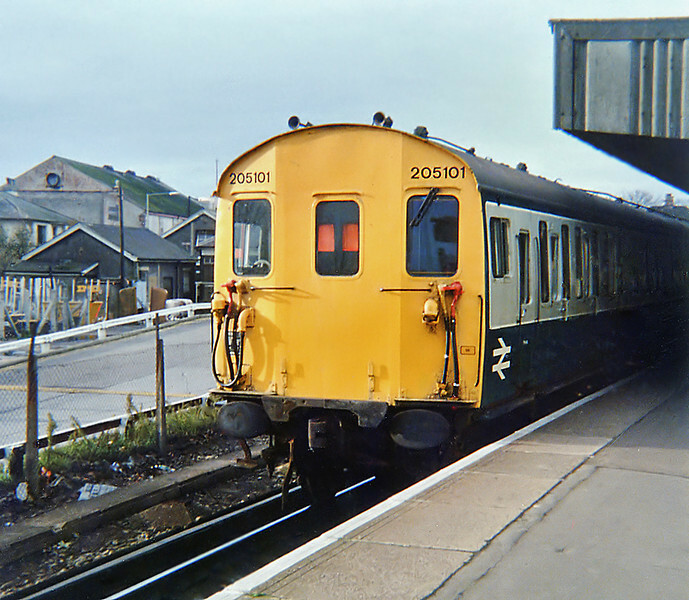 From memory it operated hourly then but now Brighton and Hove run it on a 10 minute frequency. I used the bus to Brighton to call off at Brighton Marina, another thing that has also changed significantly since my last visit. Whilst I had left St Pancras on a Javelin to Ashford, the journey back to London was on a Southern service to Victoria. This turned out to be operated by a class 442 'Gatwick Express' unit, ironic as the train I was on was first stop East Croydon so didn't even stop at Gatwick! 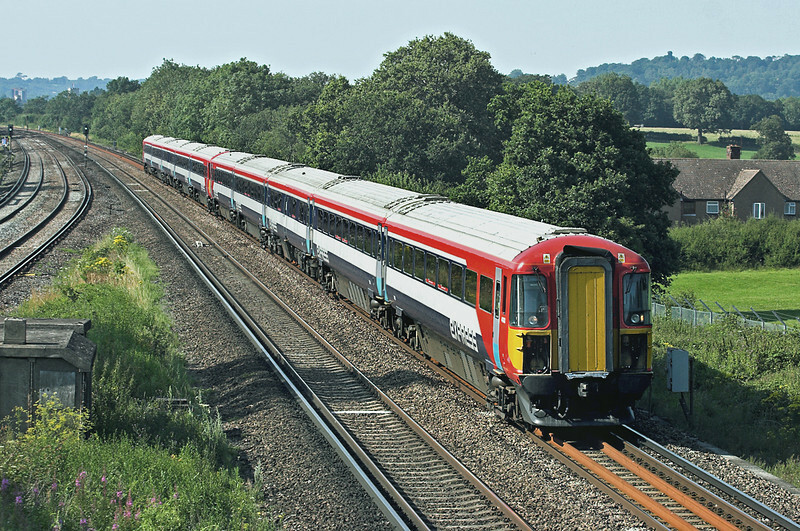 I believe there are a few problems now with 'Southern Only' tickets not being valid on trains between Gatwick and Brighton as they are branded 'Gatwick Express', even though they are all operated by Southern. Well it's back to scanning now for me. I still have a years worth of digital pictures to re-size; I finished doing my Swiss pictures from 2008 over Christmas (they can be seen HERE ). I've started doing pictures I took in 2003, working backwards from when I switched to digital. These scans are obviously not of the same quality as that which can be acheived on modern equipment, and many are not helped by the fact I used some dreadful ISO800 film at the time. Those I have added so far, like that of 47770 above, can be seen in the New Additions section for the next month or so. I'm also hoping to retrieve some slides from my mothers house. I have no idea what the quality of these are as they are mainly ones my dad took in the 1970s, so I hope some are salvageable. I have as yet no firm plans on any more trips in the next week or two, though please keep an eye out here for updates. I'll leave you with a picture of the last train I travelled over the Marshlink Line on before this week, a scan of a print taken on the frankly dreadful 126 square format film that used to inhabit my childhood point and shoot camera! From November 1986: Bye for now!